In 1817, during a church meeting of the nearby Duffield Baptists, a member asked "can we not begin preaching at Belper?". As a result, a "Baptist Cause" was established in Belper, continuing as a branch of Duffield until 1823. At that time, there was a single Baptist Fellowship whose members came from several districts, the two main ones being Duffield and Cow House Lane. Meetings were held at both these locations, but members were entered on a common roll. 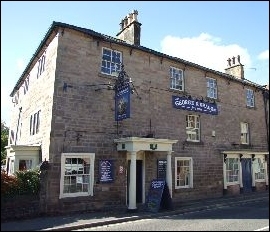 A room was hired at the "George and Dragon" inn (pictured left), which is still a local pub. On August 24th, 1817, the room was opened for public worship by Brother Ingram who acted as minister. The first member from Belper entered onto the area roll was a Mr Abbot, who joined in September 1817. The geographical area of membership had now become so wide, that at this time the Church voluntarily divided in two. One area took in Wirksworth, Shottle and Cow House Lane; and the other Duffield, Windley, Milford and Belper. An appeal for a Chapel and Burying Ground at Belper was launched the next year. Eventually sanction was given by the Baptist Association for this and a Chapel was built in Belper. The land for the chapel was given by Mr Hardy. After the chapel was built, meetings and communion alternated between Duffield and Belper. No opening date is recorded, but the first anniversary was on March 19th 1820. The work in Belper was so favourable that the Minister came to live in the town. 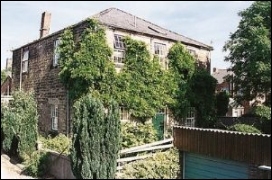 Mr Ingram left for Heptonstall Slack in 1821 and was succeeded by Mr Smedley at a stipend of £30 per year. In the following year, the church became separate causes at Duffield and Belper. Thus Belper itself became independent. The original chapel is now a privately owned self catering cottage that sleeps 20 people. More information is available here.